The difference between Detroit and New York. 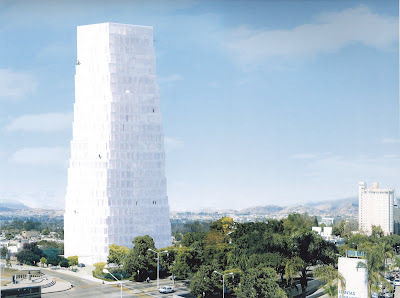 As each gets a new museum for contemporary art. And I thought ours was bad! Of course one can’t compare. The odds were stacked like the boxes in New York. 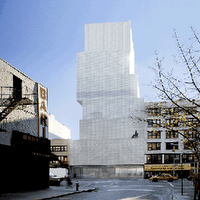 NY’s New Museum spent $50 million on their building on the Bowery. They had considered just renovating an old warehouse in Brooklyn. But they thought big and beautiful, which contemporary art deserves. The building in Detroit is a much lower cost conversion, from an old car dealership. But here’s what troubles me. “draws inspiration from the squatters’ houses, performance spaces, local bars and grass-roots art projects that have sprouted amid the disturbing stillness of the neighborhoods: a kind of forgotten underworld tucked into ruined houses and storefronts surrounded by lots that have been abandoned for so long that they have become overgrown fields. The architect had no interest in smoothing over the scars, which are worn as badges of pride. Is this how to revive a city? I see that a lot of deep thought went into this creation – for example I like the big glass garage doors that roll up in the summer to open the museum to the community, and that its galleries run around a large community space with a bookstore and a cafe. The budget was small and they hope to raise $5.5 million more for a more elaborate renovation by Mr. Zago that could be completed by 2010. The cafe will be extended and a sculpture garden is planned. So judgement must wait. But I think that our civic institutions ought not slide down to the level of hoodlums. We raise the neighborhood up by providing exaltation in an art museum, not by romanticizing decay. You are currently browsing the archives for the SANAA category.